Mombasa is located in the Indian Ocean, with breathtaking white sandy beaches, crystal-clear blue waters and awesome beachfront hotels. Welcome to the land of watersports, golfing and perfect place to cool off after a Kenya safari. Mombasa hotels are great holiday spots for both couples and families. Come enjoy the Swahili culture and the Kenyan warmth. Sail away to relaxation and recreation at the Voyager Beach Resort an ideal resort for couples and families. Is is one of the leading All Inclusive hotel in Mombasa. 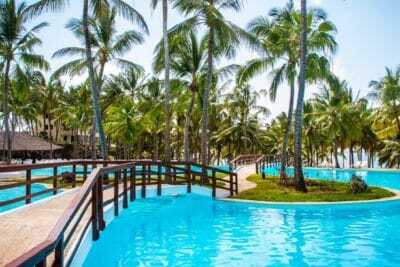 Flamingo Beach Resort & Spa is an all inclusive Mombasa hotel located amidst beautiful gardens and overlooking the stunning Shanzu Beach and emerald waters of the North Coast of Kenya. PrideInn Paradise Mombasa is the newest Family hotel in Mombasa on the Kenya Coast. It is only 25 mins from Mombasa City and also accessible from Vipingo Airstrip. 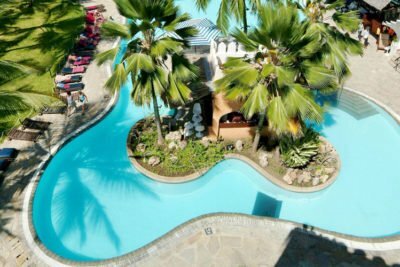 Serena Hotel Mombasa will immerse you in local culture as you revel in lush tropical gardens and winding lanes, all reminiscent of a traditional Swahili town in the 13th century. One of East Africa's finest resorts. 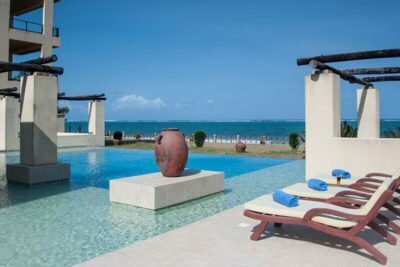 This Mombasa hotel is located on one of the longest beach fronts at the Kenyan Coast. All rooms and suites have been tastefully furnished by Kenya's leading interior designers offering spectacular ocean, pool and garden views. English Point Marina hotel is 5 Star Mombasa hotel perfect for the modern business traveler. Enjoy spectacular views of old town Mombasa, the harbor and Fort Jesus. 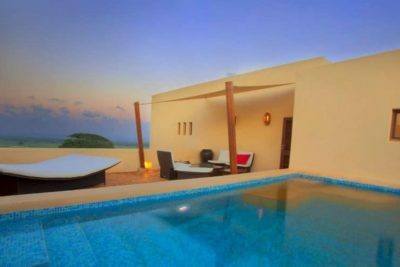 Vipingo Ridge sits on a 2500-acre estate between the coastline and green inland hills to offer an upscale stay in a tranquil and serene environment. 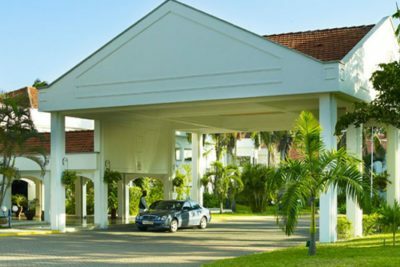 Nyali Sun Africa Beach Hotel & Spa has established a reputation for excellence and is acknowledged for offering quality and value. 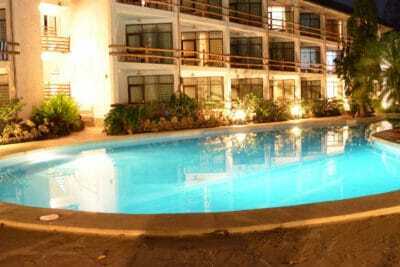 This Mombasa Hotel combines state of art as best facilities with dependable service. Despite the fact that Mombasa has been deemed the “Kenyan Coast” and home to the numerous Mombasa Hotels she has her charms. She will draw you in with seductive temperatures and lingering breezes. Then drown you in welcoming smiles and hospitable embraces. Mombasa is all about art, culture, tradition and religion and all these aspects have made a very major impact on the people of the Kenyan coast. With art being not just a form of expression but a language and it is viewed both a skill and a divine calling. Travel to the second largest city in Kenya, the East African business hub, the city of dreams and battles, salt and spice, of sea ferrying, of poetry and of loads and loads of traders from far and beyond. 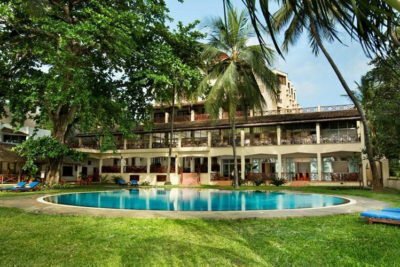 Mombasa town is crowned by some of the best Mombasa hotels that are well known for some of the best hospitality standards in the whole of Africa. The city nicknamed as ‘Kisiwa Cha Mvita’ meaning ‘The Island of War’ has vast interesting and pompous faces. Mombasa is the city where life never comes to an end and the night is more active than the day. Enjoy the nightlife of Mombasa by visiting some of the modern clubs that are situated along the busy roads and centres. Being the regional tourism center and also bearing a large port and an international airport, Mombasa is a hive of activities. Mombasa’s Moi International airport is just a 45minute plane ride away from the Jomo Kenyatta International Airport in Nairobi; by road Mombasa is 8hours away from Nairobi. Most of the Mombasa Beach Hotels are less than 30 minutes drive from the Mombasa City center. This can be viewed in whichever place you will stay in Mombasa. 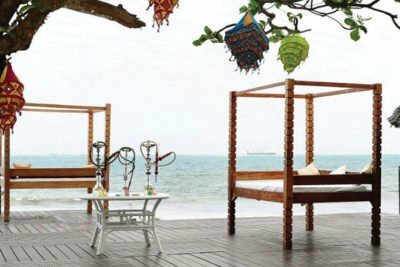 There are a lot of fun things you can do in Mombasa; Take a ride on a Swahili Dhow or Jahazi where you will drink the most delicious tropical cocktails while you cruise down the coastline just as it was done in the olden days, before the coming of speedboats and cruise liners. Visit the renowned Forte Jesus; a place so rich in history that it is said if you listen carefully you can hear the cries of the African slaves before they left their home land and never to return. 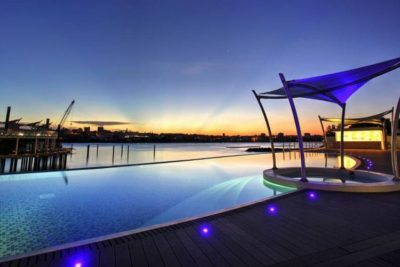 If you are one for the night life, Mombasa hotels have something for you too, the clubs and casinos will give a new meaning to “party till the sun comes up”. You can avoid the crowded beaches by getting your hands on our Mombasa holiday packages that are offered. This will allow you to get the most of Mombasa at an affordable rate. You can hire a boat and go out to sea, take a walk in old town, encounter the nature trail and get a taste of the sun as it kisses the ground good night. It’s important to understand the map of Mombasa in order to decide on which Mombasa Hotels you would want to stay in. On the Main Island there are a good number of Mombasa town hotels most of them are not on the beach front. For most people going to Mombasa the allure of the beach is too strong. Every one wants to stay in a beach front Mombasa hotel. 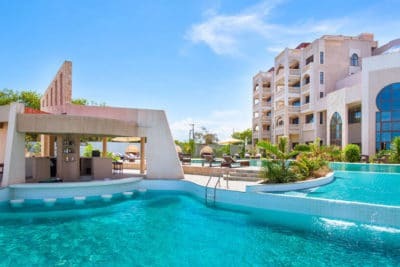 If you intend to stay in a Mombasa hotel near the Nyali area and you are not ready to experiment on the service being offered, go to Voyager Beach Resort. 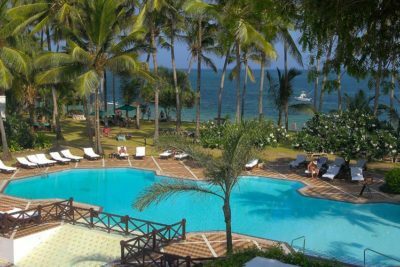 It’s an all inclusive Mombasa hotel that have a vibrant kids club and good number of pools for Adults. The Nyali area is a high traffic area. Its Ideal for those who want to experience the Mombasa way of life. Sarova White Sands Beach Resort and Spa have over the years proved to be a favorite Mombasa hotel for many in this part of Mombasa. 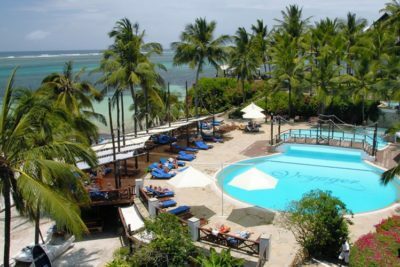 Travellers Beach Hotel is equally good and worth consideration for anyone looking to compare the two Mombasa hotels. 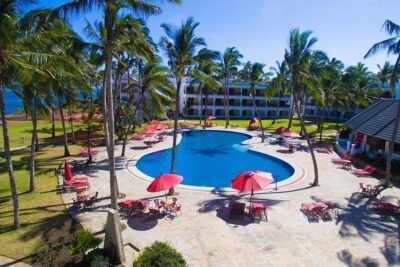 The three main Mombasa hotels worth considering in the Shazu area are Serena Beach Resort & Spa, Pride Inn Paradise Beach Resort and Flamingo Beach Resort & Spa . The Shanzu area is a great place for honeymooners and families. Visit the Bombolulu Workshops which are popular attractions for tourists who love jewelry, wood and leather crafts and textiles. Hindu Temples are a sight to behold in the Coast region and thus attributes to the cultural diversity. Here you will be able to view idols, artifacts, pictures and cultural paintings. Filled with beautiful vegetation and small marinas, this Indian Ocean inlet is a sight to behold famous for bird watching, biking tours along and around the creeks and also serves as the starting point for trips fro deep fishing. Visit the theatre that showcases Hollywood and Bollywood new releases at a fee. The same roof houses a casino with a bowling alley and an Italian Restaurant. Take a dhow (traditional Arab sailing ship), ride to Funzi Island and explore the River Mangroves by canoe for lots of bird life up close and crocodiles. Take a shower at a magical sandbank in the Ocean and feast on seafood and a lobster at Robinson Crusoe Island.